more interested in bees, I have received FREE trap monitoring. Also it is becoming more and more apparent that in my area, a trap in someones sparsely treed lawn with open fields all around is very productive. Those traps seem to be getting hit more this year than my “in the woods” boxes. This is patterning as referred to in Looking for Spots. When you observe a productive pattern….. REPEAT! Bees moving all around the front of the trap. Several times this spring I have gotten calls from excited trap hosts, “The BEES ARE HERE!!! !” After three of such calls, when I was free, and the trap was close I went to observe and visit with my neighbors. On all three occasions I was able to witness something I had not seen last year. I have been present when swarms have hit traps at my house, and this was different. What I am used to seeing. 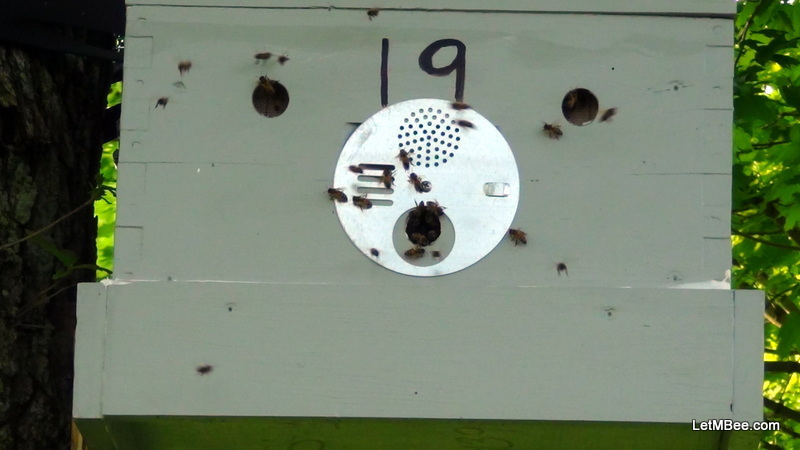 On previously witnessed hits enough bees converged on the trap to cover a lot of surface of the trap. 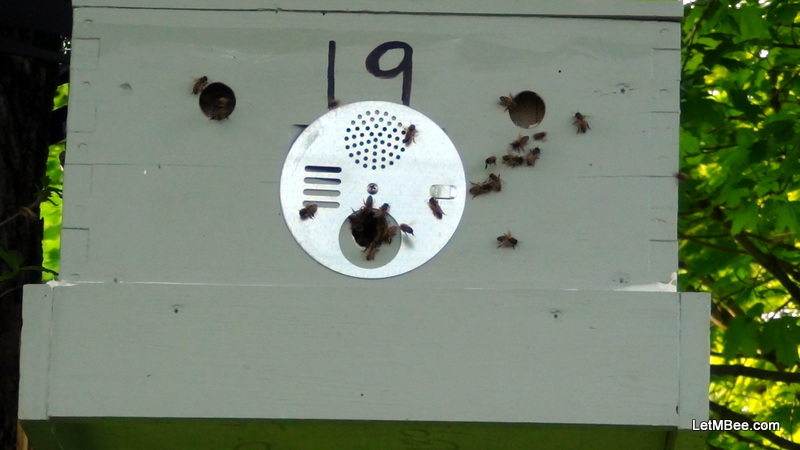 There were bees sufficient enough to be hanging off of the front and bottom of the trap in a clump. Then they would then begin to flow into the trap hole in a semi-orderly fashion. Also there had been very little traffic exiting the trap, a MAJOR difference from this other behavior. What I have seen this year is smaller groups of bees perhaps only several hundred. The activity on the front of the trap was different as well. 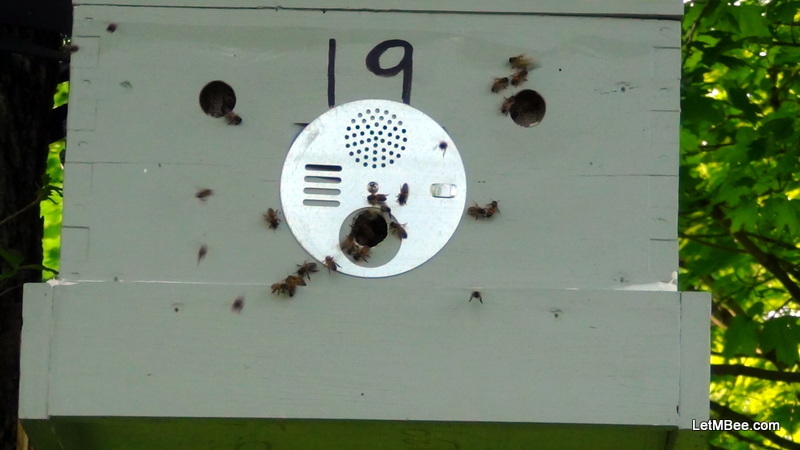 There were bees coming AND going, buzzing loudly and walking around in circles and figure eights on the outside surfaces of the trap. Both arriving and departing traffic appeared to be coming from the same general direction. I don’t know if the activity on the trap should be interpreted as excitement or agitation, but it was not the calm orderly procession I had been accustomed to. Some bees ended up staying the night in the trap. Then on all three occasions I received another phone call within one to two days. “There are even more bees here now!! !” I was able to return to one of the traps. At that time I witnessed something more similar to what I have been accustomed to. Unfortunately I didn’t have a camera with me that day. So what does it mean? I don’t know yet. I assume that these are large numbers of scouts. I do not know if this “pre-swarm” telegraphs the arrival of the main swarm in every instance? Perhaps I just missed it before. I wonder if there are several locations where this display is occurring while the group determines where they want to relocate. I have not yet been able to find the location where the bees are coming from and or going to while this is going on. The next time I get one of these calls I will try to track them down. If anything this should be a warning to anyone wanting to begin swarm trapping. Wait until you have bees carrying pollen before you mess with a trap you suspect is occupied. What do you think? If you have an idea let me know in the comments section. 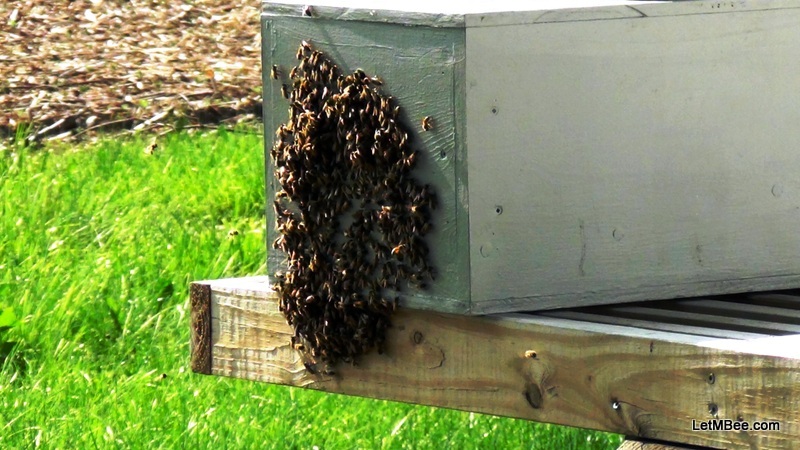 This entry was posted in HowTo, Swarm Trapping, Uncategorized and tagged bait hive, beekeeping, Indiana beekepeing, Jason Bruns, Swarm, swarm trap, swarm trapping, swarming behavior. Bookmark the permalink. I put no food in the comb. It is just old brood comb. Due to the fact that I had very little of it this year a lot of my traps just have old frames in them that smell like bees. It seems to be doing the trick. It is a possibility. I have another trap that has been getting heavy attention. The host has called several times stating that they see traffic going in and out but no pollen yet. I think it is getting ready to hit soon. This has been going on for about 3 or 4 days. I know how he feels. I remember a trap displaying some activity last year. I saw no pollen and moved it. They failed before I even had a chance to hive it. My trap took two days of bees visiting in small number before the real swarm came. Moved my trap swarm to a friends yard tonight, 6 drawn frames in 11 days, will have to box them up next week and get my trap back in the tree. We had a speaker at our beekeeper club two months ago that studied bee behavior on a beeless island. They took two different kinds of bees, that could clearly be seen as different bees and set up a swarm trap on the treeless island. They video taped the bees finding the trap and defending it, to the death sometimes. The bees changed often who was protecting it, fascinating if you ask me. That’s great on your trap. Things have slowed down here swarm wise during the past week or so. It has been pretty dry. I have one trap that the host has called me about several times. I am going to check it out tomorrow. He has seen no pollen, but bees have been coming and going for several days. I think I saw a primer about that study in either Bee Culture or ABJ a couple months ago. There are so many fascinating things about bees. Did the speaker have any notes or pamphlets that they handed out?